Antioxidants are among the most important cosmeceuticals, with proven ability of inhibiting cellular damage. The topical skin administration of antioxidants is essential for minimizing skin aging and achieving better skin protection against harmful free radicals. However, their unfavorable physiochemical properties such as chemical instability, excessive hydrophilicity or lipophilicity and others could be a great obstacle against their skin promising effects as well as their delivery to deeper skin layers. These problems could all be remedied through the use of delivery carriers. 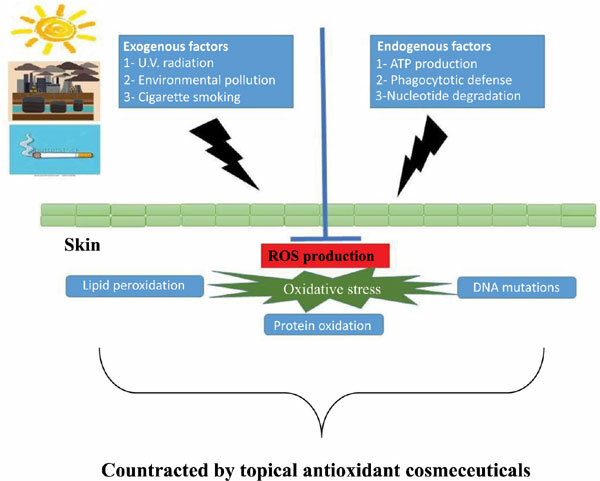 The present review discusses the various delivery carriers which were proven successful in improving the beneficial effects of antioxidants against skin aging, namely different vesicular systems, lipidic systems, polymeric systems and carbon nanotubes, and their applications in topical antioxidant delivery. Antioxidants, oxidative stress, topical, carrier, vesicular systems, lipidic systems.